Moho as seen from orbit. Moho is the third-smallest planet and the one closest to Kerbol, with an orbital period of 102 days, the shortest in the Kerbol system, and an orbital velocity ranging from 12-18km/s, is also the fastest celestial body in Kerbal Space Program. It is the Mercury analogue. 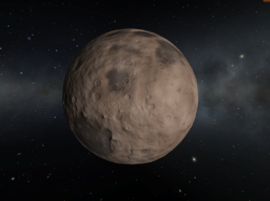 Moho lacks an atmosphere and natural satellites. The planet gets its name from the Mohorovičić discontinuity, the boundary between the Earth's crust and mantle. Moho's inclined, low, and eccentric orbit and lack of atmosphere or moons (for aerobraking and gravity assists, respectively) make encountering the planet relatively difficult. Without an atmosphere to retain or block heat, Moho's daytime surface temperatures can exceed 300°C, making radiators an absolute necessity if any part (such as drills or engines) must be cool to operate both safely and effectively. Moho rotates very slowly, its solar day being over 100 times longer than Kerbin's, which means that reconnaissance satellites will likely wait a long time between targets, but it also means that there may be several opportunities to perform individual measurements across multiple orbits. Although Moho's close proximity to the sun increases solar panel output to 10.4x that of Kerbin's at periapsis, excessive heat can cause cooling issues for mining operations and the extremely long nights will necessitate bringing an alternative power source (RTGs or fuel cells) for extended surface operations. “ Moho figures in Kerbal mythology as a fiery place with oceans of flowing lava. In reality however, it’s much less interesting. Moho's surface ranges from light brown highlands to dark brown basaltic basins and a large depression called the Northern Sinkhole near the North pole (not to be confused with the Mohole)-these features, together with surface reports, strongly evidence the presence of past volcanism. Its highest point is in its northern hemisphere at an altitude of 6817 m. Moho's heavily eroded surface and lack of ground scatter despite there being no atmosphere suggest active space weathering processes. Moho has a very deep well at its geographic north pole, called the Mohole. The Mohole is about 4.6 kilometers deep, and has a descending angle of 80 degrees. The hole is a glitch in the procedural generation of terrain; many other bodies with land at the north pole have similar bugs. Despite the appearance of another hole at the geographic south pole in Map View, one does not exist. The Mohole can destroy craft and kill Kerbals that fall into it. Moho has 12 biomes. It is one of three bodies (the other being Kerbin and Ike) that have their own North and South Pole biomes. It is dotted with Minor Craters and features four distinct Lowland Biomes. The Mohole is registered as part of the South pole despite being at the North pole. Mohosynchronous and semi-synchronous orbits are impossible — they would require altitudes of 18 182.08 km and 11 361.48 km respectively, both of which are beyond Moho's sphere of influence. Moho is the apparent Kerbol System analog of the planet Mercury. Both share a similar cratered landscape, like most bodies with little to no atmosphere. Due to the lack of an atmosphere to retain heat, Moho and Mercury are freezing on the night side and, relative to Earth, extremely hot on the day side. Both planets are also the closest to their respective stars, share a similar orbital eccentricity and lack natural satellites. A topographic height map of Moho as at Version 0.18.2 made with the ISA MapSat plugin. A successful landing at Moho pre-0.18. Note the engines still overheating. A successful landing in 0.23.5, after Moho's color was changed and its superheated atmosphere was removed. The walls of the basins are quite steep. A probe wedged in the 5 km deep lava well at the north pole. A probe performing a Moho flyby. Hanny Kerman wedged in the Northern Mohole sideways. Lots of orientation jittering was observed. A spacecraft carrying a probe decelerates to enter into orbit around Moho. Vessels pick up a lot of speed approaching this inner planet. 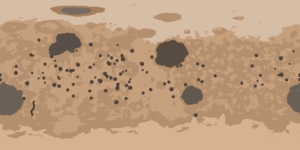 New, procedurally generated, textures added, with higher detail craters. Entirely changed more cratered surface. Color changed from red to brown. This page was last edited on 21 June 2018, at 20:53.